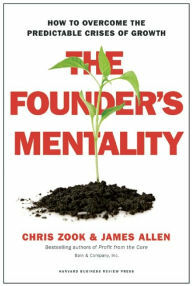 In The Founder’s Mentality: How to Overcome the Predictable Crises of Growth, Chris Zook and James Allen identify and discuss three predictable crises that can result from growth. Chris Zook is a Partner in Bain & Company’s Amsterdam office and has been co-head of the Global Strategy Practice for the past 15 years. He specializes in helping companies find new sources of profitable growth. He is the author of five books with Harvard Business Review Press in the past ten years including his Repeatability: Build Enduring Businesses for a World of Constant Change, published in March 2012. Among his best-selling books are Profit from the Core: a Return to Growth in Turbulent Times (HBRP, January 2010), an updated edition of his 2001 book, Profit from the Core: Growth Strategy in an Era of Turbulence, Unstoppable: Finding Hidden Assets to Renew the Core and Fuel Profitable Growth (HBRP, May 2007) and Beyond the Core: Expand your Market without Abandoning Your Roots (HBRP, November 2004). James Allen is a partner in Bain & Company’s London office and a coleader of Bain’s Global Strategy practice. He has served a variety of leadership roles at Bain and is the founder of the Bain Founder’s Mentality 100, a global network of high-growth companies mostly led by their founders. Allen has more than twenty-five years of consulting experience and has worked extensively for global companies in consumer products, oil and gas, technology & telecommunications, healthcare and other industries. He has advised clients on the development of global growth strategies, emerging market entry strategies, and turnaround strategies. If you read a better business book than this one in 2016, please let me know immediately.